This prototype appears to be in the mid to late stages of development. 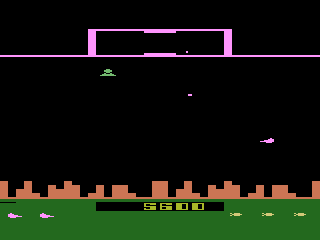 All the gameplay is there, but the sounds and colors are vastly different. Even though the case gives a date of 9-15 the internal EPROMs say 10-30. 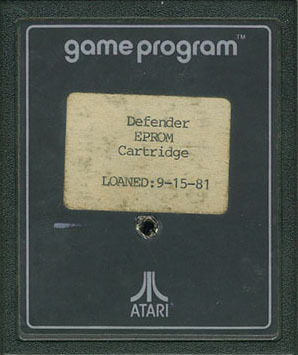 It's not uncommon for the wrong date to be on the outer case, always remember to check the EPROMs inside for the true date. No copyright message on start up. 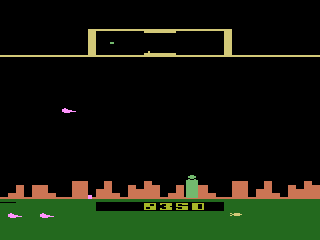 When starting the game on an Atari 7800 you automatically use a smartbomb. 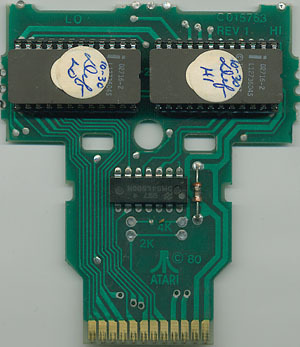 This glitch doesn't occur on the emulator and is probably due to minor timing differences in the 7800. You cannot start the game with the fire button, only the reset button. 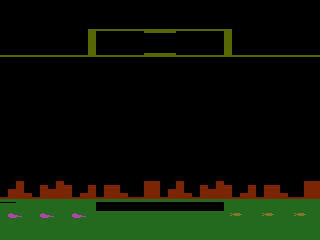 The level colors are very different: The ground is green, the city is orange, and the ship and scanner are pink. The enemy colors are also different: The landers are green, the pods are pink, and the mine layers are pink. 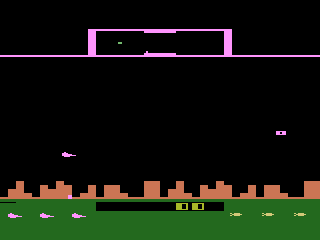 Many sounds are missing: The mine layer sound, the human abduction sound, the saving a human sound, the smart bomb sound, the start of game sound, and the end of level sound. The player death sound is different. The beam the landers use to capture the humans is green not tan. The game is slighty harder. Bob Polaro's initials may not be present (untested). Pink mine layers. Silent and deadly!